The police arrest Dharma, a woman claiming to be Kate's estranged mother, and charge her with murder. To prove Dharma's innocence, Kate, her boyfriend Michael, and her German shepherd sidekick Bella dive deeply into the worlds of animal activism and organizational politics. As they investigate the dangerous obsessions that drive these groups, Kate and her sleuthing team discover that when it comes to murder, there's no place like hOMe. 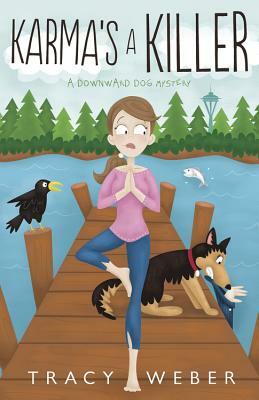 Tracy Weber is author of the award-winning Downward Dog Mystery series. Her first book in the series, Murder Strikes a Pose, won the Maxwell Award for Fiction and was nominated for the Agatha Award for Best First Novel. A certified yoga therapist, Tracy is the owner of Whole Life Yoga, a Seattle yoga studio, and she loves sharing her passion for yoga and animals in any way possible. Tracy and her husband Marc live in Seattle with their precocious German Shepherd pup Ana. When she's not writing, Tracy spends her time teaching yoga, trying to corral Ana, and sipping Blackthorn cider at her favorite ale house.